Do You Need Legal Assistance With Truck Accident or Other Personal Injury Claims? Our trusted and experienced Hawthorne truck accident lawyers and law firm can provide expert personal injury legal services for those injured in truck, car, motorcycle and other accidents, and for the relatives and families of those killed in truck, auto and other fatal accidents for wrongful death claims, in Hawthorne, Los Angeles and all of California. 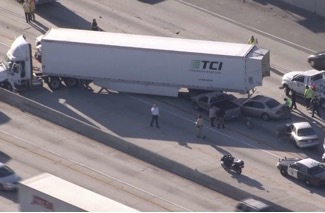 So, if a close relative or a beloved family member has been a victim of a truck crash or accident involving an 18 wheeler or any big rig truck or other vehicle, and you need legal counseling for injury or wrongful death accident claims in Hawthorne, Los Angeles, please contact our personal injury attorneys and law firm now for a completely FREE CONSULTATION and CASE EVALUATION. Different issues may arise in a truck accident personal injury claim or truck accident wrongful death claim – than in a typical car accident claim - for which prompt investigation is advised. Therefore, for detailed understanding of your case and evaluation of your options, please visit our Truck Injury Accident Advice Section to learn more about the truck accident injury claims process. Feel free to call us at 1-866-INJURY 2 or 818-222-3400 for a FREE TELEPHONE CASE EVALUATION about your specific truck accident or other injury accident case. We offer FREE consultations via phone (for your convenience) or even in our personal injury law office, if you prefer a personal face to face meeting. Located towards southwestern Los Angeles County, California, Hawthorne is a city bordered by Gardena, Lawndale, Redondo Beach and El Segundo. As per the United States 2010 Census, the estimated population of Hawthorne, Los Angeles, Calif. was 84,293. Approximately, five miles from the Los Angeles International Airport (LAX), the city is the hometown of numerous notable personalities. For instance, Olivia Harrison graduated from Hawthorne High School, class of 1965. Olivia was the second wife of George Harrison, multi-instrumentalist from the famous English rock band The Beatles. Other noteworthy and famous people who were born in Hawthorne, Los Angeles, are former Major League Baseball player Tracy Jones and actress Marilyn Monroe who lived in Hawthorne from her infancy to the age of six. Our experienced Hawthorne truck accident personal injury lawyers and law firm possess tremendous experience in resolving personal injuries and wrongful death claims. In fact, our accident lawyers provide legal services not just in Hawthorne but in Los Angeles and throughout California including in Torrance, Gardena, Carson, El Segundo, Hermosa Beach, Manhattan Beach, Inglewood, Culver City and West Los Angeles. Our aggressive but compassionate attorneys and law firm have recovered more than $100,000,000.00 in funds for its clients. Or you can even fill our contact us form, and we shall be immediately notified to help you learn about your options. So, Call Us Now For A Free Case Evaluation! You will be glad you did! FREE CONSULTATION – NO FEE UNTIL YOU WIN!